Last Fall was $14.90. 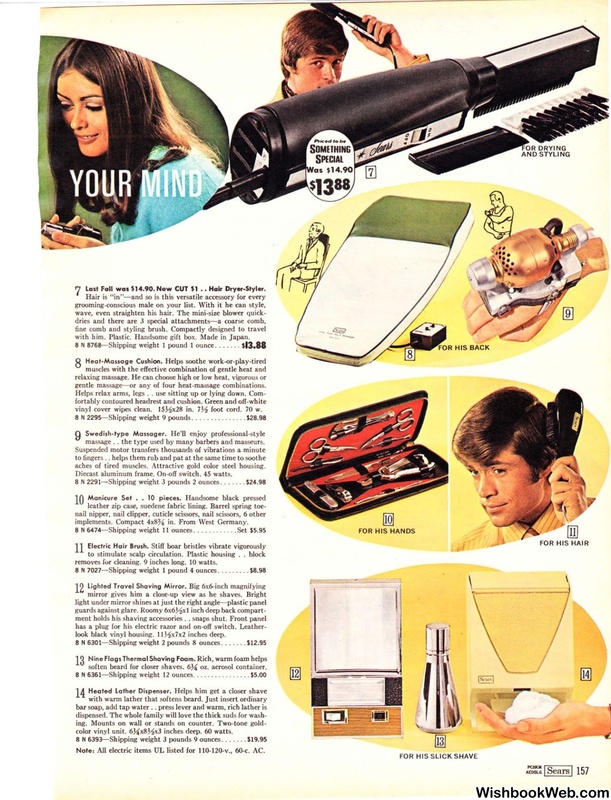 Now CUT $1 •• Hair Dryer-Styler. with him. Plastic. Handsome gift box. Made in Japan. gentle massage-or any of four heat-massage combinations. vinyl cover wipes clean. 15,Vix28 in. 731 foot cord. 70 w.
massage .. the type used. by many barbers and masseurs. aches of tired muscles. Attractive gold color steel housing. Diecast aluminum frame. On--0ff switch. 45 watts. implements. Compact 4x8;!4 in. From West Germany. 6474-Shipping weight 11 ounces. . . .
removes for cleaning. 9 inches long. 10 watts. look black vinyl housing. 1131x7x2 inches deep. soften beard for closer shaves. 6U oz. aerosol container. 6361-Shipping weight 12 ounces. .
color vinyl unit. 6Ux8_Vix3 inches deep. 60 watts. Note: All electric items UL listed for 110-120-v., 60-c. AC.